From our entrepreneurship programs to our economic impact, from our innovative approach to education to our success in securing patents—ASU is recognized as a higher education leader and innovator by local, national and international organizations. The following are a few of our latest honors and rankings. 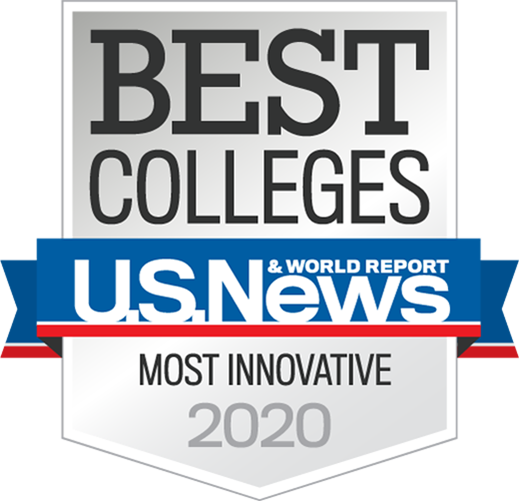 For the third year in a row, U.S. News & World Report ranked ASU #1 among the Most Innovative Schools in America for 2017, ahead of #2 Stanford and #3 MIT, as well as Duke, Harvard and Cornell. The top rating was conferred by leading college officials across the country based on ASU’s curriculum, faculty, students, campus life, technology and facilities. ASU was selected as The Entrepreneurial University at the Deshpande Symposium for Innovation and Entrepreneurship in Higher Education in 2016. ASU ranked #38 among worldwide institutions in earning utility patents in FY 2015, according to the National Academy of Inventors and the Intellectual Property Owners Association. The Association of Public and Land-grant Universities designated ASU an Innovation and Economic Prosperity University in 2016. The Kauffman Index of Growth Entrepreneurship maps the 40 largest metro areas in the U.S. by their high-growth entrepreneurial activity. In 2016 they ranked Arizona #3, based on rate of startup growth, share of scale-ups and high-growth company density. Washington Monthly named ASU President Michael Crow as one of the 10 most innovative college presidents in the U.S. in 2015, for his success at increasing access while raising graduation rates. ASU was selected to receive the 2015 Community Engagement Classification from the Carnegie Foundation for the Advancement of Teaching. The classification is bestowed upon institutions that have demonstrated deep engagement with regional, national and global communities. ASU Selected as "The Entrepreneurial University"
Three ASU Alums on "30 under 30 list"